A growing collection of public domain gardening images for crafters. 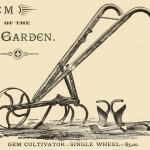 From garden tools like shovels, hoes and wheelbarrows to adults and children working in their gardens this collection of garden images offers a variety of public domain drawings that can be printed and/or downloaded. If you are more interested in pictures of the wonderful things we like to grow in our gardens, be sure to check out our collections of flower images, fruit drawings and public domain herb drawings. 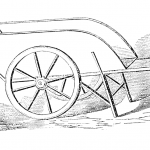 Vintage metal wheelbarrow drawing from 1861. A great black and white illustration to use with your own art and creative projects. A great public domain gardening image. 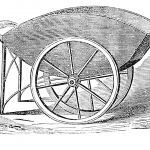 Vintage wooden wheelbarrow in black and white from an 1867 engraving. Want to mark lines for planting in your garden? Then having a marker like this vintage garden marker might be exactly what you need. 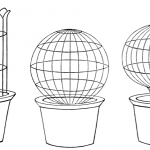 How cool are these vintage topiary forms? These public domain drawings were commissioned by the federal government in 1864. 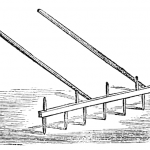 Vintage seed catalog image of a single-wheeled garden cultivator for sale. Over 120 years later and the tools we use today don’t look all that different. Simple, black and white drawing of a shovel. 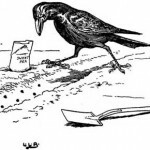 Drawing of a crow tending his vegetable garden. 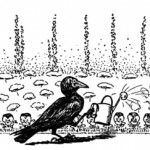 Fun drawing of a crow watering his flower garden. Black and white wheelbarrow drawing. Vintage drawing of a watering can. Black and white garden gate drawing. 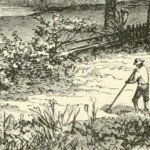 Drawing of a man turning over his garden.